This dark blue 71% acetate and 29% polyester evening jacket is by Nicole Miller and has a very nice black 100% silk lining with an interior lining trim in an eggplant-wine color. 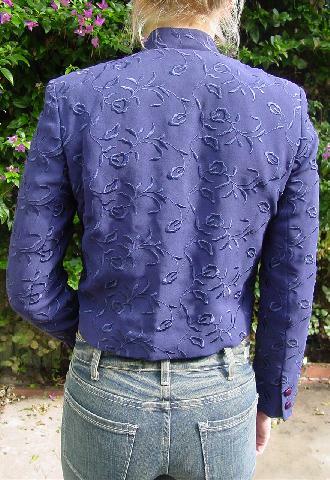 The surface has a flower and leaf embroidery pattern. There is a mandarin style collar, shoulder pads, long sleeves with 2 buttons on each, and 5 buttons down the front. 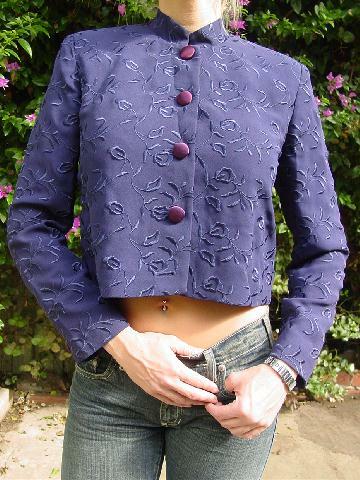 The fabric covered buttons are in the eggplant-wine color. The tag says size 6, but it fits like a size 4.
shoulder to end of sleeve 23 5/8"
shoulder to hem 18 1/2"
side to side bottom hem 18 1/4"
armpit to armpit 19 3/8"